I get email daily from people who tell me they want a work-at-home job, but all they run into is scams. I’ve even met people who tell me all work at home is a scam. The truth is that there are tons of work-at-home jobs, you just have to look for the right type of work in the right place. Too many people go online hoping to sign-up for a menial job that involves typing or data entry. But legitimate work-at-home jobs are like traditional jobs. Many have the same titles (teacher, nurse, accountant, writer, assistant) and the same requirements as traditional jobs. 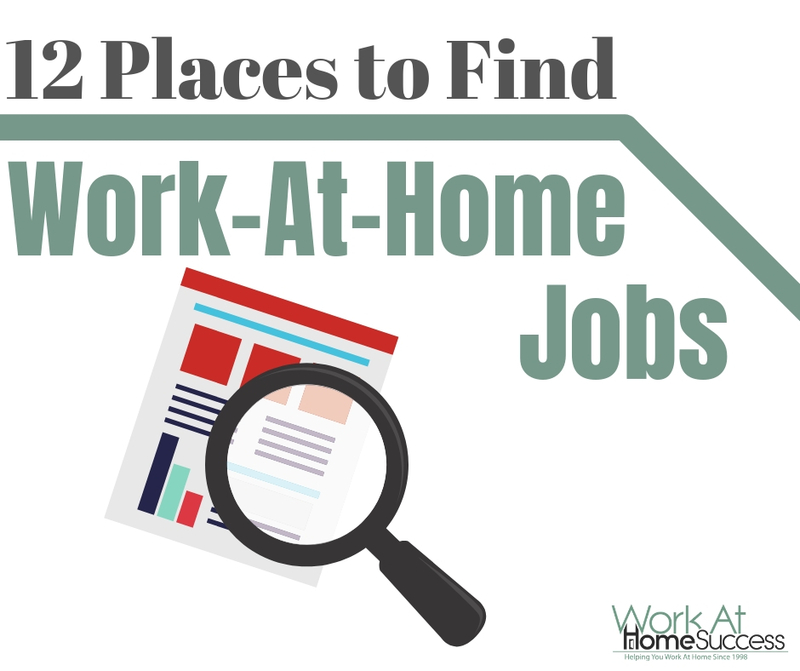 As you use the resources below to search for work, treat your work-at-home hunt the same way you would a traditional job hunt. Look for work that requires the skills, experiences and interests you have. As a reminder, while you never want to pay to get hired, it is okay to pay for services that screen and list legitimate work-at-home jobs. A couple of the resources below charge to access their database of jobs. I recommend these resources because they can save you a lot of time weeding out biz ops and scams from other job sites. However, I only recommend them for people who are serious about finding a work-at-home job and understand that you won’t simply sign up to stuff envelopes or type. Finally, while many of these places list telecommute jobs that offer salaries and benefits, many are contract work. Don’t forget to check out WAHS’s work-at-home job listings. We post new jobs several times a week, plus you’ll find a job feed that searches for WAH jobs from around the net. You can find them all on WAHS. The sites below focus on offering work-at-home or flexible jobs. The advantage of these sites are that they only post work-at-home jobs and they screen them to help you avoid biz ops and scams. FlexJobs – Has tons of work-at-home and flexible job options plus a personalized login system that will identify jobs that fit your criteria, ability to have multiple resume profiles, job search tips and checklists, and much more! For the number of jobs and added service, its a must use for the serious work-at-home job hunter. You can see WAHS’ FlexJob review for more information. HomeJobStop – has over 100 jobs in clerical, and more in customer service, writing, transcription, miscellaneous plus 100’s of others. Very affordable. RatRaceRebellion – Jobs are posted for free on a daily basis. You can also search jobs by categories. 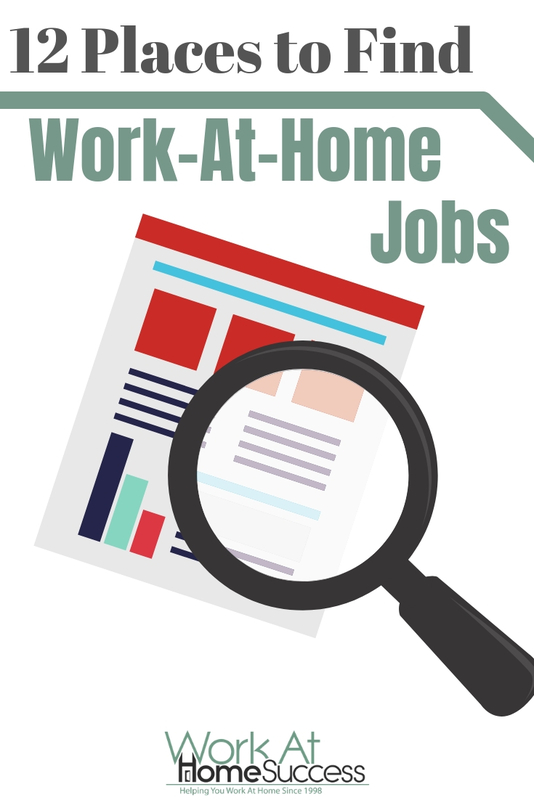 Like Work-At-Home Success, the free jobs are supported through advertising, so you’ll find ads listed near the jobs. Real Ways to Earn Money Online – This site offers regular home-based money-making ideas plus a directory of work-at-home jobs by category. The Work-At-Home Woman – Holly has lots of great work-at-home info and this page of work at home resources. 👉Don’t forget, you can search the Work-At-Home Success Job Board for free! These sites offer all sorts of jobs, including work-at-home jobs. You’ll need to use the search feature to find the home-based opportunities. Use work-at-home related keywords such as telecommute, remote, and “work at home” (in quotes). There are many companies that have work-at-home jobs that only post on these sites. However, scams and other money schemes can get posted on these sites, so you need to make sure you know how to screen the legit jobs from the duds. Ad Hunt’r – pulls information based on your search term from Craigslist. The advantage is that it saves time in having to go from city to city on Craigslist when doing a job search. However, you’ll want to watch out for scams and deceptive schemes. Carebuilder.com – Lots of work-at-home jobs in customer service and nursing. Canadian job seekers can use CareerBuilder.ca. Monster – Search jobs using “work at home” or “telecommute.” Canadian job hunters can visit Monster.ca. SnagaJob – Lists many work-at-home jobs. Similar to Monster and Careerbuilder, you can set up a profile and receive email when jobs that fit your criteria are posted. Workopolis – This is a Canadian job site on which you can search for work-at-home jobs. ZipRecruiter (use search box below for ZipRecruiter)- Like Indeed and SimplyHired, ZipRecruiter has tons of jobs, including telecommuting opportunities. You can search International jobs as well. Just put your country in the “Location” box. See below for a sample of the jobs you can find at ZipRecruiter.